In conjunction with this year’s British Open Championship, Mercedes-Benz has unveiled the Vision Golf Cart. Are you tired of riding around in the same old dorky golf cart during your Sunday round of golf? Well, Mercedes-Benz has designed a new golf cart with you in mind, and believe me: This isn’t your father’s golf cart. Unveiled at last weekend’s British Open Championship, Mercedes’ Vision Golf Cart is an uber-cool golf cart, which includes everything you’d expect to find in a luxury vehicle and nothing you’d expect from a typical golf cart. Before you get worked up into a frenzy, there is something you should know first: Mercedes doesn’t plan on actually producing it. The images you see are what the Vision Golf Cart would look like if the automaker decided to produce it. The concept is actually the collective effort of hundreds of golf fans around the globe that submitted their design ideas. The Mercedes-Benz design department then took some of these ideas and created what you see before you. Leading the project was Mercedes-Benz design chief Gorden Wagener. Wagener, who prefers to call the vehicle a “Golf Car,” says that the concept is refined yet functional, placing it firmly in line with Mercedes’ “Sensual-Purity” design philosophy. Now that we’ve gotten that out of the way, let’s examine what makes this vehicle so unique? Interior wise, a central joystick operates the cart so riders on either side can control its direction. Other features include an iPad/iPod dock, speakers, interactive touchscreen, heating/cooling cup holders, a cooler/warmer refrigerator, seat controls, an “air scarf” heater (in case your neck gets cold), and a “Fore!” button you can press to either signal a wild shot or just to mess with your friends. As impressive as the vehicle’s interior is, the exterior couldn’t possibly be any more striking. The vehicle — which looks like it should be patrolling space rather than a golf course — touts a solar panel roof, LED headlights, Mercedes diamond grille, Double A-Arm suspension, and electric hub motors. 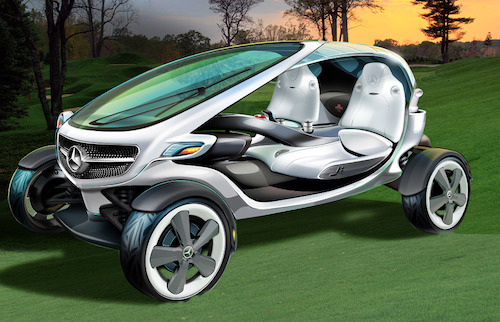 Click over to Daimler.com to check out ten images of the Vision Golf Cart. As for the British Open itself, Phil Mickelson managed a comeback for ages after he closed Sunday with a 5-under par final round to take home his first Claret Jug. The 43-year-old Mickelson began the day five strokes off the lead, but managed to surge to victory after birdying four of the last six holes. The win marks Mickelson’s fifth career major championship win. He had previously won The Masters three times and the PGA Championship in 2005.